The ventricular system of the brain is an interconnected system of cavities and ducts within the brain through which cerebrospinal fluid (CSF) circulates. The CSF is produced in the choroid plexuses located within the ventricles. There are two large curved lateral ventricles, each found within a cerebral hemisphere. They connect with the third ventricle via an opening called the "foramen of Monro". The third ventricle connects with the fourth ventricle by way of a slender canal called the "cerebral aqueduct" or the "aqueduct of Sylvius". The third ventricle is found deep within the brain between the right and left diencephalic portion of the cerebrum. 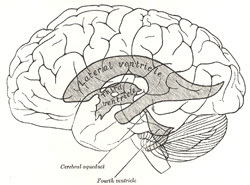 The fourth ventricle is located between the pons of the brain stem anteriorly and the cerebellum posteriorly. This ventricle has a rhomboidal shape and it connects with the external aspect of the brain and the subarachnoid space. Failure of this CSF drainage from the ventricles to the subarachnoid space can lead to pathological accumulation of CSF within the ventricles and hydrocephalus. The superior image shows a lateral view of the brain with a superimposed image of the ventricular system. If you click on this image, you will see a superior view of a cast of the ventricular system (by Retzius). More information on these images at www.bartleby.com. The inferior image shows a posterior view of the brain stem and the cerebellum which has been opened in the median plane to expose the 4th ventricle. Click on the image to see a larger version. Inferior image property of: CAA.Inc.